Welcome to the first installment of “The Consequences,” a series of chats about the issues being debated in this year’s political campaign. A couple of times every month, we’ll gather a group of FiveThirtyEight staffers and invited guests for a conversation on subjects in the news, particularly when the subjects are complex and could use a little illumination. That’s an apt description of our first subject, international trade, which has become a central theme in this year’s presidential race. Our participants this week are two members of FiveThirtyEight’s economics staff, Ben Casselman, chief economics writer, and Andrew Flowers, quantitative editor. Also joining us is Dr. Shushanik Hakobyan, assistant professor of economics at Fordham University and a scholar of U.S. trade policy who has extensively analyzed the North American Free Trade Agreement (NAFTA) and other international pacts. The moderator is David Firestone, FiveThirtyEight’s managing editor. David: International trade has emerged from wonky obscurity to become one of the most heated issues in this year’s presidential campaign. Given its complexity, were you surprised to see trade blamed for so many of the country’s economic woes, attacked from both right and left as the reason for slow job growth and stagnant wages? Shushanik: I was not at all surprised. Trade issues become hotly debated in every election season. The campaign rhetoric eventually gives way to a much calmer tone after the elections. Just recall the 2008 election season when Obama was campaigning against NAFTA. It was very similar in spirit to what we’ve seen this year, now with an added incentive to bash trade in the run up to the vote for the Trans-Pacific Partnership (TPP). Ben: I agree, Shushanik, but I do think there’s something a bit different this time. For one thing, you have both major-party nominees coming out against the TPP, and Donald Trump has built his whole campaign around protectionism, which is unusual for a GOP nominee. Andrew: It’s revealing the degree to which resentment about trade has been one of the driving issues in this election, at least in explaining Trump’s appeal. It’s an indication that the costs from trade have been very concentrated — more so than we thought. It’s hit a certain segment of American workers very hard. They’re angry and disaffected. For many of them, trade is to blame. Shushanik: I agree, Andrew, but much of the research, including mine on NAFTA, suggests that a very small share of the labor force is affected by trade. Yes, it is true the impact is very concentrated not only by sector, but also by location. Trade is an easy scapegoat for the economic situation and it is much more easily understandable by an average person. David: What do each of you think of the quality of the debate we’re seeing? If you had a personal truth-o-meter, how would you rate the assertions that Trump and Sanders are making on trade in general, and the TPP and NAFTA in particular? Ben: It’s interesting you highlight those two, David, because I think a lot of the evidence suggests the impact of both those agreements probably pales (or will pale, in the case of TPP) to the impact of trade with China. Research from MIT economist David Autor and various colleagues has pointed to pretty substantial impacts from liberalized trade with China, on the order of 2 to 2.4 million lost jobs. Andrew: I don’t think Trump has elevated the debate on trade. His approach is populist and mercantilist — in the sense that “winning” at trade means exporting more to other countries than we import from them. He is furiously promising to renegotiate trade agreements and win a better “deal,” even if that means slapping a tariff on Chinese goods, which could potentially bring disastrous consequences via an escalating trade war. Sanders, on the other hand, has just flatly opposed trade deals — both old and new. But Ben is right: Far more important than NAFTA or the TPP is China. That research by Autor et al. is stunning: they estimate at least 1 million U.S. manufacturing jobs were lost due to the rise of Chinese imports. David: OK, let’s talk about China for a minute, and then get back to NAFTA and Shushanik’s research on it. Trump seems perfectly willing to start a trade war with China and has actually said it would have little harmful impact. Is there any economist out there who believes that? Ben: There are some mainstream economists who have argued for at least a pause in new agreements. But I don’t know of any who think a trade war with China is a good idea. Andrew: There are several reputable economists arguing for a more confrontational stance with China on specific trade issues like manipulation of their currency. But no serious economist would recommend what Trump’s saying he’ll do: tax Chinese imports until they give in to our demands. Ben: Right. There are legitimate questions about whether China is playing by the rules in terms of opening up its markets. Shushanik: I have yet to see any analysis confirming Trump’s claims on the impact of a trade war. The truth is that an average consumer benefits greatly from Chinese imports via lower prices and increased variety. Plus businesses are able to obtain intermediate goods [such as raw materials and parts used in manufacturing] at lower prices. Let’s not forget that about two-thirds of our imports are actually not final goods. Andrew: Yes, the gains from trade with China are real — in the form of lower prices on goods — and these benefits disproportionately help poor Americans. But the costs from this trade with China are not diffuse but concentrated. Ben: MIT Technology Review had a fun piece the other day looking at what the iPhone would look like if it were made entirely in America. Shushanik: A few years back there was also a study showing that much of the value of an iPad is American, and only a small share is Chinese value added. David: But why is it so hard for many Americans to see those benefits? Lower prices and variety always seem to be pushed to the side when trade is blamed for jobs. Ben: Those benefits are individually small, even if they’re large in the aggregate. But a lost job is very big and easy to see. As Andrew said, the benefits are diffuse and the costs are concentrated. Shushanik: Andrew is right. And this is true of any trade policy. Ben: Of course, many would argue that we can help offset those costs — job retraining, direct benefits, or other programs to help people who lose jobs adjust. That’s the idea behind the “Trade Adjustment Assistance” program. But we haven’t expanded those efforts, and it doesn’t look like we will anytime soon. Andrew: When people blame trade they often don’t just mean being out-competed by cheaper Chinese imports. They’re using trade as a stand-in for offshoring and outsourcing, too. Shushanik: Here’s another example: Sugar costs twice as much in the U.S. than abroad due to quotas. As consumers we pay a few cents more per year, but the profits reaped by sugarcane farmers are huge. Andrew: The real failure in American trade policy hasn’t so much been in specific deals or in the push for globalization more generally. The failure, as Ben noted, is that our safety net never modernized as trade expanded. Ben: Not to mention automation. 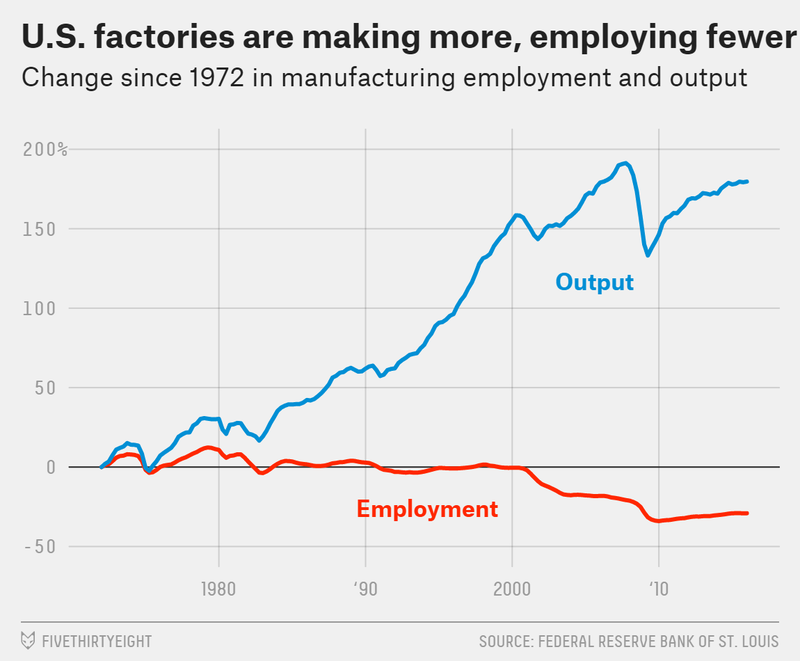 Remember: U.S. manufacturing employment is down, but output is way up. Andrew: Yes, but these trends predate the expansion in trade. They’re due to technology. To me, the real inflection point in how economists viewed trade happened in the 1990s, when trade joined technology in being a powerful driver behind the decline in manufacturing jobs. Shushanik: Offshoring is also part of the story and cannot be ignored. Just recall the Carrier case recently. Andrew: It’s China joining the World Trade Organization (WTO) in 2001 that was the real game changer. David: As you mentioned, Shushanik, the debate is similar around any trade pact. NAFTA is widely reviled by unions, for example, but your research has shown that much of that derision is undeserved. Shushanik: NAFTA had an overall positive impact on real income in the U.S. There’s no indication that it had any impact on long-term employment. True, some jobs were lost in the short run, but job creation over the medium and long run outweighed jobs those lost due to NAFTA. For most U.S. workers, any change in income due to NAFTA was insignificant. But for workers who were in the industries most vulnerable to imports from Mexico, blue-collar wage growth was significantly slower than for other workers while NAFTA was being implemented. That was also true for workers in locations where such vulnerable industries were concentrated. Ben: I think it’s important to keep all of this in the broader context of the stagnation, or at least the anemic growth, of wages, particularly for those without a college degree. Some of that is trade. Some of that is globalization in other forms (outsourcing, etc.). Some of that is technology. Some of that is fiscal policy. And we can argue about how to allocate the blame. But the problem is real. I think what has shifted somewhat is our understanding of how durable the negative impacts are for people who do lose jobs. The places that are hit hardest don’t seem to rebound as quickly as we once thought, as Autor and his colleagues recently noted. That doesn’t change the fact that liberalized trade is a net positive for the economy. But distribution matters too. Shushanik: There were many structural changes in the U.S. economy, along with external factors (China’s W.T.O. accession, other low-income countries opening up to trade, etc. ), that could be responsible for the decline in manufacturing jobs. Ben: Right, part of the challenge here is there were a lot of changes hitting at once. It’s hard to tease out the specific factors that drove these trends. Shushanik: Past experience with trade agreements suggests that although most workers will neither gain nor lose much, U.S. blue-collar workers in unskilled labor-intensive manufacturing industries are likely to suffer income losses. And if there are locations in the country where such jobs are concentrated, blue-collar workers in those locations (whether they are in the service sector or the manufacturing sector) are likely to suffer losses. However, such workers are much less numerous than they were at the time of NAFTA, since the manufacturing sector employs so many fewer Americans than it once did. David: And yet it’s always a trade pact that gets the blame — the fallacy of the easy target. The consensus by the disaffected candidates on the right and left will put a lot of pressure on the center, though — specifically, Hillary Clinton, who has turned critical of the TPP. Do you see a long-term shift coming in how mainstream Washington thinks of trade and globalization, moving away from an earlier free-trade consensus? Andrew: Economists’ consensus on trade circa 2000 was that it was good for the economy as a whole; and while there would be some “losers,” they would eventually find jobs in other industries or move to more prosperous towns. That hand-waving confidence in the benefits of trade now looks misguided. Ben: One other trend that I think is important here is the decline in labor market mobility. People are changing jobs less often, they’re moving (physically) less often, companies are creating and destroying fewer jobs. And that makes it harder for workers and regions to adjust to shocks, including those caused by trade. And unfortunately, we don’t really understand what’s behind that decline in dynamism, or how to reverse it. Andrew: Clinton is in a bind, though: her husband supported and signed NAFTA, against the wishes of most Democrats. And while she is now against the TPP, she is still associated with President Obama, who supports it. Ben: I strongly doubt that Clinton has suddenly turned into a huge trade skeptic. She turned against TPP — I won’t try to guess whether that was purely political, but politics clearly played a role — but she isn’t railing against trade the way Trump is. So if she wins, I suspect we’ll retain the basic trade policy we’ve had since NAFTA, with maybe just a bit more of a nudge to the left. If Trump wins… who knows? It’s notable that he doesn’t say he wants to end free trade, he just wants better agreements, whatever that means. Shushanik: From the economics point of view, the costs of turning isolationist far outweigh the benefits. But politics guides many of the economic decisions. My hope is we won’t see such long-term shift. Andrew: I also wonder how much of the political backlash to trade is tied to the state of the economy. If five years from now, low-skilled labor is doing much better, will the TPP stand a better chance? I don’t know. Ben: All this talk of the TPP is interesting because by most estimates I’ve seen, it just isn’t that big a deal in a macro sense. When I talk to economists about it, I hear a lot of “meh.” Paul Krugman has described himself as a “soft opponent,” for example. Shushanik: I do agree with Ben’s point on labor market mobility. Perhaps this is where we should focus our attention — implementing appropriate policies to make industry or location adjustments more smooth and less costly. Andrew: I understand the view that the TPP isn’t a big deal for the U.S.; that it’s mostly about intellectual property rules, and environmental and labor standards. But it’s a huge deal for the other 11 countries! Vietnam, for instance, is still poor but could gain a lot from greater trade. Shushanik: Yes, Andrew is right, Vietnam and Malaysia will be the largest beneficiaries from TPP. David: That raises the question of whether these big pacts could be better designed, and whether the details even matter to the politics. For all the debate over the environmental and intellectual-property provisions of the TPP, do the specific provisions and details matter to the overall critics? The big unions even opposed the beneficial provisions in the TAA, because they thought it would make overall passage easier. Ben: I would argue that research on NAFTA vs. China suggest the details DO matter. One reason trade with China seems to have been more costly is that the U.S. opened up to Chinese imports without getting much in return. Andrew: For pro-trade economists and politicians to be successful, they need to not just negotiate better trade deals. They need to revamp the U.S. social safety net. Ben: Right. I think one reason many Democrats, even relatively moderate Democrats, are concerned about trade deals now is that they don’t think they can get adjustment benefits through Congress. Shushanik: Labor and environmental provisions were part of NAFTA as well. The new areas included in TPP include digital trade and state-owned enterprises [i.e., the rights of companies when their assets are nationalized by a government]. Andrew: That’s an important point about state-owned enterprises. Because, assuming the TPP passes, and if China ever wants to join later, that would have a huge effect on their economy. It’s a strategic move by the U.S.: make a trade deal with all of China’s neighbors, which tempts them to possibly join later. But then China has to play by America’s rules. Shushanik: China is likely to lose if TPP passes. Specifically in terms of reduced exports, particularly textiles, apparel and electronics. In addition, TPP might cause major shifts in value chains [the process of design, manufacturing and distribution that adds value to a product at each step] that involve China, resulting in production locations shifting from China to other TPP-member countries in Asia. Ben: Ooh, now you’re talking in terms Trump understands. Ben: I know you’re kidding, Andrew, but I think it’s a huge problem that these debates often DO get talked about in those terms. All this discussion about “losing” and needing to “beat China” is really unhelpful and, in from an economic standpoint, simply wrong. Shushanik: The Peterson Institute for International Economics and Brookings often provide good analysis. Andrew: That’s a tough question. I kind of do the opposite: Read pro-trade outlets like the Peterson Institute, alongside pro-labor trade skeptics like the Economic Policy Institute. Ben: Yes, both Peterson and Brookings are very much pro-trade, especially Peterson. But their arguments are grounded in facts, and they have good data. I think the most important thing to remember is to be skeptical of any claims that are too extreme in either direction. Opening up trade was a huge deal a century ago. But at this point, the effects in either direction are pretty marginal. Which doesn’t mean it isn’t an important issue. It is! But the claims on either side get ridiculously extreme. Andrew: Good advice, Ben. That said, we’re still struggling in the U.S. to cope with ramifications of globalization, especially China’s ascent to a global trading power. Ben: Right, which is why I’d really like to see more attention on how we improve service-sector jobs, promote dynamism, etc., and less on manufacturing. These are the kinds of policies that could make a real difference to a much larger number of workers. I’ve argued before that candidates talk far too much about trade, and manufacturing more generally, when they should be talking about how to make service sector jobs better. David: Yes, skepticism is particularly warranted this year. I think we covered a lot of ground here on our imported computers and I’d like to thank each of you for an enlightening hour.